To mark 200 years since the publication of Mary Shelley's groundbreaking novel, Frankenstein, Liverpool Book Art presents 'Frankenstein 2018', a new touring exhibition currently on display at Liverpool Central Library. 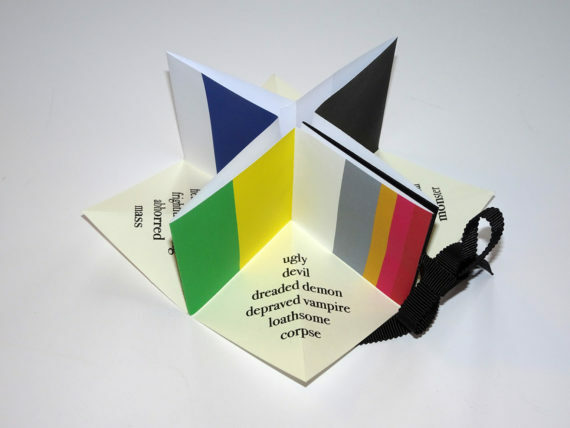 Sarah Bodman introduces some of the artists' books on show. 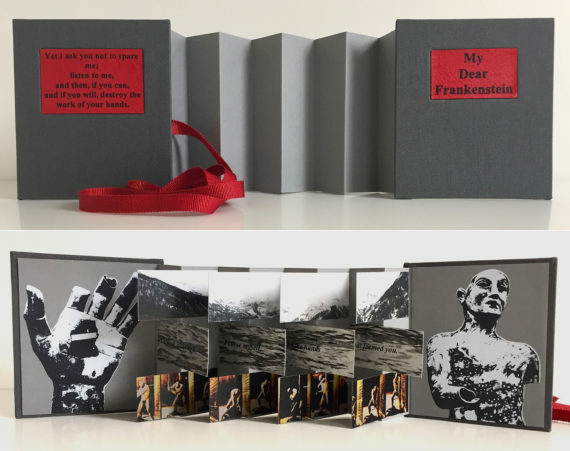 Liverpool Book Art recently launched ‘Frankenstein 2018’, a new touring exhibition which is currently on display in the suitably historic Hornby room at Liverpool Central Library. This exhibition celebrates the bicentenary of the first published edition of Mary Shelley’s Frankenstein. 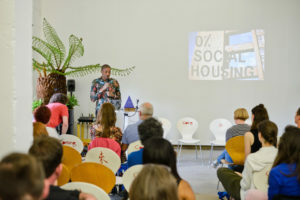 A call out from Liverpool Book Art invited artists around the world to submit proposals to create books in response to the novel. The resulting publications have been varied and numerous, with some particularly creative interpretations worth highlighting here. Corinne Welch produced the beautifully morbid, hand-embroidered, altered found-book Momento Mori, inspired in part by the references to miniature portraits in the novel, the idea of remembrance, and Victorian society’s love of embroidery. 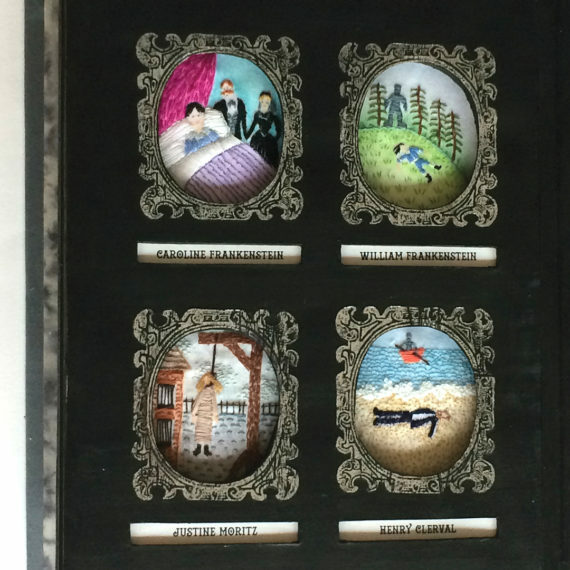 Each character’s death is represented in a silver foiled peephole vignette. Daniel Lehan’s Rinfantenesk is comprised of 18 pages, a reference to Shelley’s novel being first published in 1818. Each of the 18 images takes the form of a letter addressed to a character, or characters, in Frankenstein. 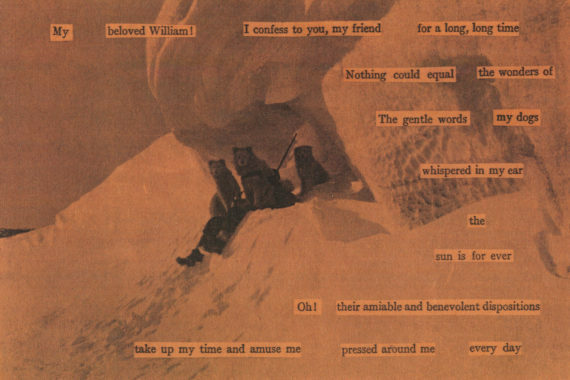 These are formed by text cut from the novel and collaged onto photographs from a battered volume of Ernest Shackleton’s Au Coeur De L’Antarctique bought in a Paris fleamarket. 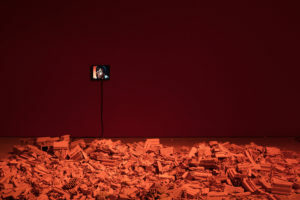 Kate Bernstein’s My Dear Frankenstein depicts the misery of creator and ‘monster’, though its empathy lies wholly with the creature as he begs Frankenstein to use the hands that created him to destroy him. Liverpool Central Library is also host to the 5th Liverpool Artists’ Book Fair, taking place on Saturday 7 and Sunday 8 July 2018. The fair showcases unique, handmade books, small editions and sculptural book works. 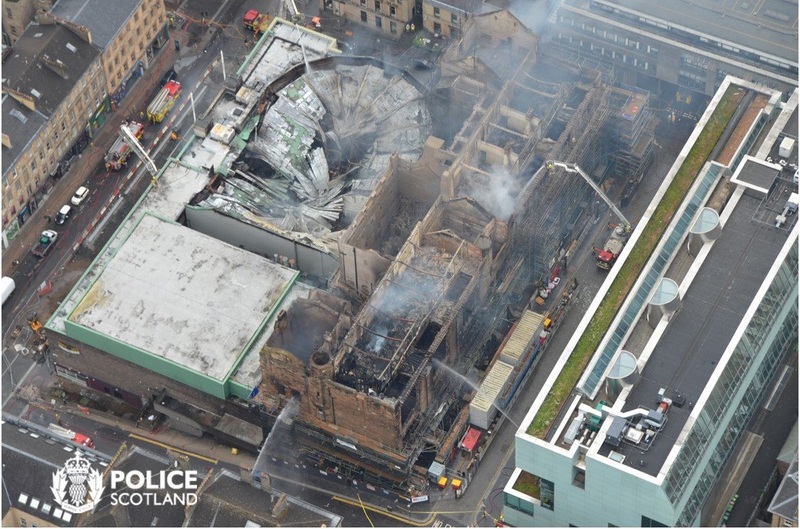 The exhibition and the fair are both free and during the course of both there are demonstrations, workshops, talks and performances. The ‘Frankenstein 2018’ exhibition will move on to the Kirkby Gallery from 17 September until 26 January 2019, adding new works created for the tour, while some of the books from the Liverpool show travel to Sarno in southern Italy as part of the ‘SettembreLibri’ festival.